A micro 25mw VTx for FPV with a dipole antenna for use on micro and mini drones. 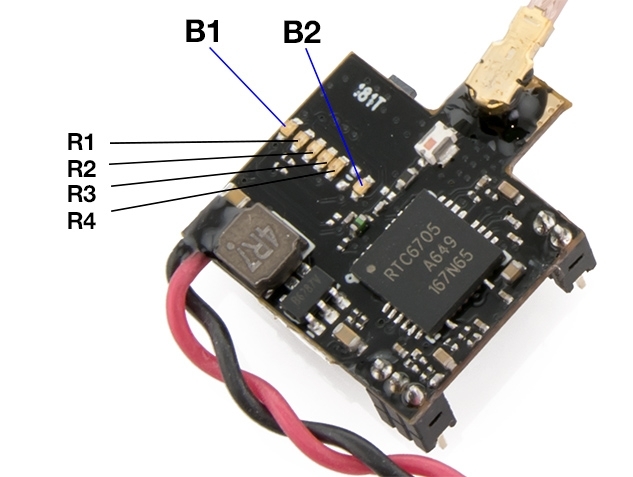 This is the Lumenier SM-25, a Super Mini 25mW 5.8GHz 32CH FPV Transmitter with a U.FL connection. The lower 25mW transmission power means more pilots can fly together without overpowering each other on close frequencies. The SM-25 has 32 channels including the new Raceband frequencies. The SM-25 features an easy to use single button, LED interface. It is micro in size and only weighs 2.1g! It stays cool to the touch during operation, so you don't have to worry about it overheating in a crash. Compatible with Lumenier, Fatshark, ImmersionRC, Team Blacksheep, Boscam and other generic branded FPV receivers within the same frequency range. Group A includes 2 blue LEDs, B1 and B2 which represent the Channels. Button Control: Short press button <1S to change channel; long press button >2S to change band. Short press to change CH 1-8. The B1 LED will stay solid for CH1, B1 flashes 2 times for CH2, B1 flashes 3 times for CH3, B1 flashes 4 times for CH4. B2 LED will stay solid for CH5, B2 flashes 6 times for CH6, B2 flashes 7 times for CH7, B2 Flashes 8 times for CH8. Press and hold button 2s to change band, F, E, A, R.
R1 stands for Band 1, R2 stands for Band 2, R3 stands for Band 3, R4 stands for Band 4. Power off memory: Saves the last frequency band and channel. *Note: TX antenna must be installed properly before it is switched on. Powering on without installing an antenna, or using an improper antenna may easily burn the TX, and such damage is not covered by warranty.